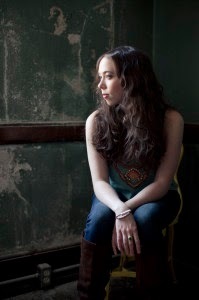 Some prodigal talent can ultimately run dry due to a lack of substance but in the case of Sarah Jarosz, the sheer depth of her ability is suggesting a fruitful career lies ahead. Initially heralded as the future of roots music when signing for Sugarhill Records at the age of sixteen, Sarah then set about consolidating her undoubted potential with a stint at the prestigious New England Conservatory of Music in Boston. Upon graduation Sarah has undertaken the most ambitious project in her short career but reaction Stateside to BUILD ME UP FROM BONES has been incredible. UK fans will be presented with the opportunity to acquaint themselves with the record via its formal January release over here and the presence of Sarah on this year’s Transatlantic Sessions tour. This third album release from Sarah, all under the guise of the Sugarhill label, has already wooed critics via a Grammy nomination for Best Folk Album and its title track being up for Best American Roots Song. Alas both were unsuccessful in the Los Angeles ceremony but the legacy of BUILD ME UP FROM BONES is set to stand the test of time. It’s a far more experimental release than her previous albums and wider creative influences acquired during her studies have flavoured a record that refuses to be confined to a traditional beat. Straight from the traps, Sarah sends a signal out that development is on the agenda with a far rockier song than you would expect from her. ‘Over the Edge’ tempts the world of Americana with a sample of her ability to mix and match the extremes of this far reaching genre. The combination of an Austin upbringing and a classical New England schooling give her an added advantage of exploiting this diverse appeal. The presence of Jerry Douglas and Chris Thile on the album ensures there are tracks which revert to form and replicate Sarah’s trademark Bluegrass sound. Thile’s mandolin heavily influences ‘Fuel the Fire’ while Douglas introduces the Weissenborn lap slide guitar to ‘Gone Too Soon’. The harmony vocals right across the album are supplied by a delightful array of contributors including Aoife O’Donovan, Kate Rusby and Darrell Scott. As intimated earlier Sarah is an immensely talented young lady and, as well as possessing divine vocals, she plays banjo, mandolin and guitar and lent a hand to having a writing contribution in all but two of the eleven tracks. The exceptions being Dylan’s ‘Simple Twist of Fate’, which consists of Sarah’s vocals and solitary cello, and ‘The Book of Right-On’, a Joanna Newson track which drifts into an elegant haze. Alongside the superb opening number which probably just shades top track status, sits the slightly languid but equally at the same time mesmeric ‘Mile on the Moon’. The beautifully constructed chorus repeatedly calling ‘If I ever wake up’ lodges in your mind and doesn’t outstay its welcome. The Grammy nominated song ‘Build Me Up From Bones’ has the added twin appeal of Aoife O’Donovan joining Sarah on vocals for a double dose of angelic roots folk. The only caveat for listening to this album is to refrain from multi-tasking as its deep sincerity demands your full attention and this will ensure maximum listening pleasure is derived. 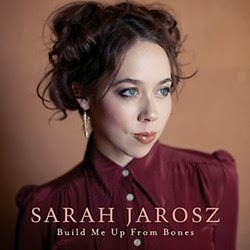 There is little doubt that BUILD ME UP FROM BONES grows the stock of Sarah Jarosz and the good news is that UK fans are set to get some opportunities to share in its riches.